Today was supposed to be my cooking day. I had planned to make a Roasted Cauliflower & Leek Tart with Port Glaze, a Herb-Focaccia, Chestnut & Cranberry Stuffing, and a Roasted Cranberry & Quince Chutney. Well, at least I was able to make one dish...one out of three is not too bad considering how lousy I feel. How can something as simple as a common cold make you feel so bad. 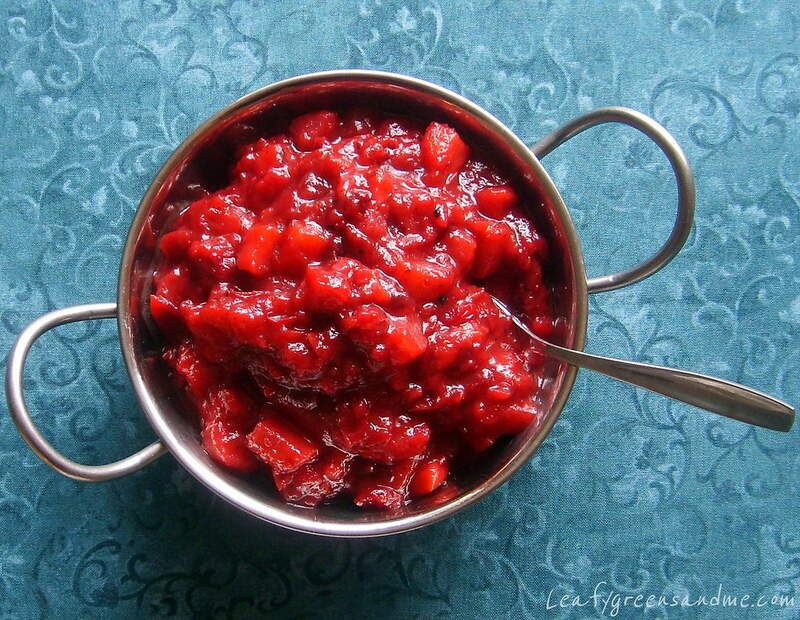 Anyway this cranberry chutney couldn't be easier. A little dicing, mixing and baking and it's done. I know that quince can be hard to find at the market so you can substitute pear, or apple. I actually used a combination of quince and Asian pears for this recipe, and when I make it again for Thanksgiving I will use Asian pears only. I really like their flavor and texture. The pears are shaped like an apple, but have the skin of a pear. And they taste just like buttered-rum, seriously...they melt in your mouth. But you may not be able to find Asian pears at your market either. Again, just substitute regular pears or apples or a combination of each. Place all ingredients into a bowl and mix really well. Pour into a 9x13 casserole dish and bake for about 1 to 1-1/2 hours, tossing every 30 minutes until fruit is soft and liquid is absorbed. Remove from oven, place in a serving bowl and let sit until it's room temperature. The chutney can be stored in an air-tight container in the refrigerator for about a week.